Who says pinstripes are just for the boardroom? This super 110s Merino wool pinstripe suit is as breathable as it is beautiful, you’ll find it as comfortable to wear on a sun-baked street as you do in an air-conditioned office. Composition: . Super 110's Merino Wool. sale and delivery process excellent. Suit seems great. not worn it yet. Great service, very easy to deal with. Impressive communication and clothing quality is impressive. I was very impressed by the service from Brook Taverner. Their website is easy to navigate and to order goods from. The goods themselves arrived relatively quickly, given that I am based in Switzerland and they were shipped from the UK. But most of all I was highly impressed with the quality of the suits - the material and fit are excellent. I will definitely be a buyer of suits and other clothing from Brook Taverner again in the future. Suits and shirts ordered. The items were delivered within two days. The quality of all the products both in terms of style, cloth and workmanship is of the highest order. An excellent transaction in all respects. I thoroughly recommend Brook Taverner. Excellent product range. Style and quality that is difficult to find on the High Street and at a very fair price. Quick service, excellent quality suits, frequent reductions. What's not to like! Excellent service with high quality clothing. Got a jacket at Christmas so went on the Brook Taverner site to have a look-see. Very impressed at the selections and prices. Ordered several suits and shirts. Sent one suit back as it didn't flatter me (!) - no quibbles, pre-paid postage, just dropped off at the post office - kept the others. Good comms on delivery. Very pleased overall. Will shop here again. I had some difficulty with the Brook Taverner site so I did it over the 'phone- superb. I did 'phone back to say thank you. Regards, John K.
Excellent service and really good quality products. Really great quality products at very reasonable prices with very quick delivery. What more could you ask for! Easy website, good range and nice suits which arrived quickly. I've bought much more expensive suits such as Baumler. Brook Taverners wools suits are just as good but less expensive. see above My son and I have made several purchases and are very satisfied customers and so will continue to do so in the future. all goods spot on. deliver fine. no hassle. Great price and quality as always. Good delivery. My boy is on the large side and starting his first job. Found a lovely suit that fits him well, excellent quality, delivered speedily, and best of all, 50% off! He's happy, and so am I. Been looking in the shops for a suit in this style and colour for 6 months without success. Surfed the web as a last resort before going "made to measure" at a local tailor and found Brook Taverner. Suit true to size, exactly as described and delivered promptly. This is the best suit my husband has ever had (and he has had plenty) he is very fussy. The rest of the family all believe he has got a made to measure suit as it is such a perfect fit. I can not praise Brook Taverner enough, wonderful service, excellent suit. If you want a good bit of cloth, go to Brook Tavener. I've been searching everywhere for an all wool suit and when I was out with a friend he had a rather nice jacket on. I asked him where he got it, particularly as it was all wool and he told me 'Brook Tavener'. I went on internet the next day and 'Eureka' I have found it. A suit at last, my measurements and in all wool. And very nice it is too. Suit arrived promptly, looked good quality but returned due to sizing issues and a new one is on its way. All very slick. I was impressed by the clear and easy-to-use website, and the level of detail provided for each product. The ability to select sizes for trousers and jackets is a useful facility for those whose body proportions do not conform to the 'norm'! My confidence was increased by the clear explanation of how to return goods, if necessary. The delivery was straightforward, in accordance with predictions, and allowed for making alternative arrangements in the event of being out of the house. The products (suit and tie) matched my expectations, so, overall, my opinion is that Brook Taverner provide an interesting range of products, and a completely hassle-free process for buying and having them delivered. First order from Brook Taverner but wont be the last. Quality very good and sizing just as promised. Quality and fashionable - That's just the service ! Website easy to use - excellent details. Items are very good quality. Fast delivery and items well packaged. First class quality, value and service. Wish we had found this company years ago. Can't believe how good the fit is , my husband looks like a new man!! Items came next day beautifully packaged . Excellent value. Highly recommended. Suit and 2 extra trousers were justa s described. Fit was great and they arrived before they said they would. All I'd say extra to a friend is, "it's a shame the website doesn't work fully with an iPad. Really happy with another purchase of quality goods at sensible prices from Brook Taverner. Speedy and efficient delivery and good packaging. I had been looking to purchase a few new suits, and had tried and failed at the usual retail outlets. As a last resort I went online and found Brook Taverner, and how glad I am that I did. I instantly found two suits that appealed and with the no quibble returns policy I thought I would give it a try. My suits arrived well within the times advertised on the site. The quality of the suits are outstanding and they fit perfectly. It has been an absolute ease to purchase from this company and as such I ordered and received my second order of shirts and ties within three days. I have already recommended to several colleagues, and would not hesitate to purchase again from Brook Taverner. Everything is excellent, merchandise through to great customer service. Ordered wrong size, returned replacement very quickly and it was spot on! Bought this suit and loved it, bought 2 extra pairs of trousers and wear it all the time for work. Wears really well. Recently discovered Brook Taverner. Quality of the suit purchased is excellent. Price also very competitive for the quality. Just about to make another purchase using loyalty points. Keep up the good work. Fantastic ..first class service and a joy to use...will be back again ...would definitely recommend. I really cannot fault the luxurious feel and quality of this suit. I have yet to find a better suit. I have wasted far too much money on the Jermyn Street retailers. If only BT had a store where you could see it before you buy, but I guess that's why the prices are so low. This is the second suit I have ordered from you and each time I have been thoroughly impressed with both the quality and the service. I placed my order on Tuesday evening and received the suit on Thursday, carefully packed, hardly a crease and ready to wear. Would be happy to recommend, thank you. Do you offer a sleeve shortening service on new suits? We don't offer any alterations on jackets I'm afraid. The only alterations we make to garments is the trouser leg length. Website easy to use - excellent details. Items are very good quality. Fast delivery and items well packaged. Awesome rewards scheme. I had been looking to purchase a few new suits, and had tried and failed at the usual retail outlets. As a last resort I went online and found Brook Taverner, and how glad I am that I did. I instantly found two suits that appealed and with the no quibble returns policy I thought I would give it a try. My suits arrived well within the times advertised on the site. The quality of the suits are outstanding and they fit perfectly. It has been an absolute ease to purchase from this company and as such I ordered and received my second order of shirts and ties within three days. I have already recommended to several colleagues, and would not hesitate to purchase again from Brook Taverner. Everything is excellent, merchandise through to great customer service. It is very refreshing! A very happy customer. Slimmer, more streamlined and flattering cuts, clean lines, trimmer lapels, and flat front trousers all made from superior material with attention to detail. It’s the signature of Brook Taverner. The structure of a suit is its very foundation. It’s where the fabric, cut and inner details come together to create more than just a piece of clothing. A well tailored suit is about how it makes you feel when you wear it and how it holds up over time. A Brook Taverner suit never cuts corners. It has just the right drape and shape, —conforming to your body, yet allowing for freedom of movement and outstanding comfort. Our half canvassed jackets are tailored to provide support where it’s needed the most, the chest and lapel, for a perfectly tailored look and fit. Extra details are always a part of our tailoring. Get to know our suits and you’ll find perfection in every piece. It’s the little things, the fine details, that are indicators of a quality suit. We pride ourselves on the subtle nuances that elevate our suits to superior status, like hand stitched lapel detailing, fully lined jackets, slimmer fitting trousers, button materials, ticket pockets, and comfort waistbands. 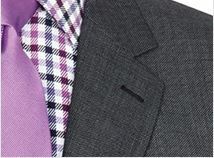 It’s the selection of these and other details which give our suits their ultimate distinctiveness. The benchmark of quality, our fabrics are carefully sourced from the finest mills in the world. From cool linens to Italian Moleskin, Harris Tweed and luxurious Merino Wool, our garments are created from the ideal material for today’s trimmer styles and streamlined appearance. Every piece is perfectly tailored to fit your body as well as your lifestyle. 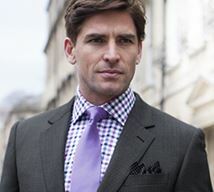 Our Brook Taverner classic fit suits are traditional and timeless. 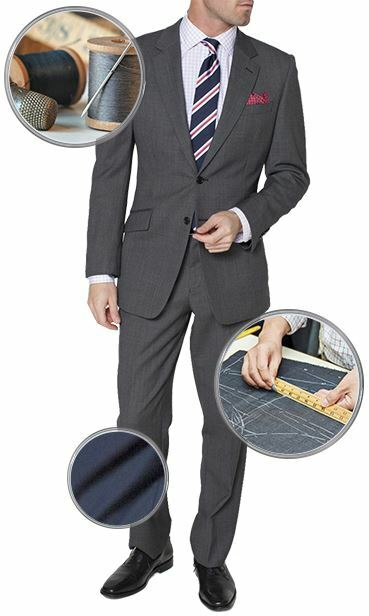 Roomy and comfortable, this suit is always the ideal choice for any occasion and smart for every body type. Keeping the tradition of sartorial excellence, our classic suits offer time-treasured tailoring that is forever in style. In a Brook Taverner classic fit suit, the craftsmanship, flawless fabric, and tailored elegance is certain to endure year after year. 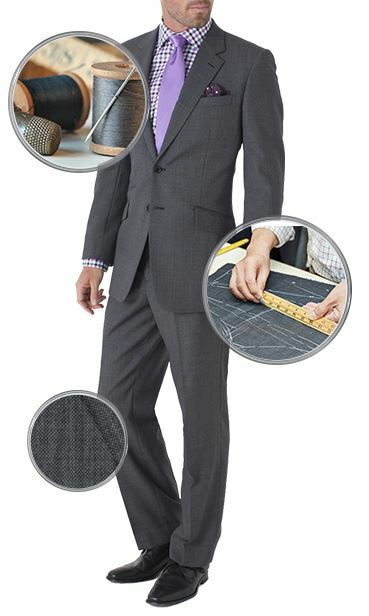 The classic fit suit jacket is cut spaciously for a comfortable, handsome fit. The jacket length is slightly longer and lapel is standard width. 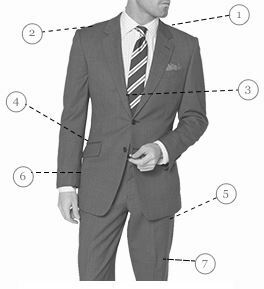 When choosing your jacket size, always try on one size smaller, especially if the shoulder hem is even with the end of your shoulders. The number one sizing mistake is a jacket that is too large. Classic fit trousers are cut spaciously and evenly. Waistband sits directly on the waist and not below. Front can be flat or pleated. Classic trousers are slightly longer, with a comfortable break at the hem.